Is Art Education Important to Our Children? Yep. Here’s why. Have you had the pleasure to watch a child completely immersed in finger painting? The awe and focus they feel is obvious, as they shove the goopy paint across the paper. At first they may be cautious, but as you watch, they fall into a tactile trance where there’s no distinction between child and paint. If you look away for a moment, when you look back they’ll be completely covered with paint, probably with some on their tongue. 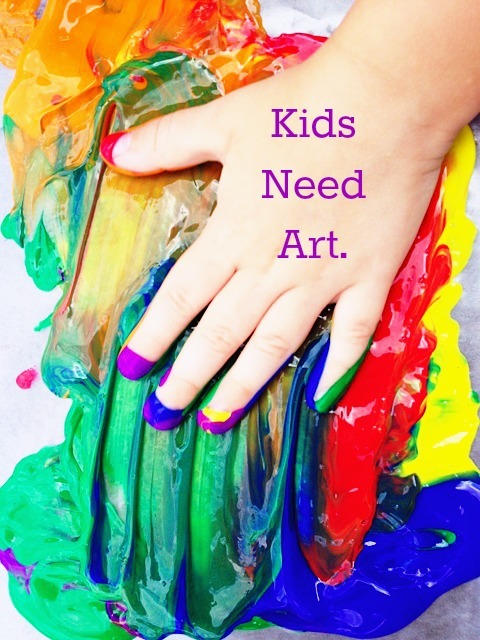 For many kids, this is their first experience with messy art-making, and they naturally want to understand it on every level possible. It’s obviously hard to argue that this is entertaining for kids, but is this sort of thing important? Do kids really need to work with art materials and learn art techniques to help them succeed and grow as humans? I know so in my heart, because I’ve had a ton of art-making experience. I know the lessons and habits I’ve learned from art education. It’s hard to pinpoint just when your brain clicks into truly understanding something, especially if it’s a concept or technique. Especially if it’s something you learn while doing one thing that can apply to another area in your life. I think art education gives you a lot of this sort of learning, and it’s invaluable. A repeat study the next year found the same results, and although they don’t show how exactly art education improves literacy, they believe it has to do with the children puzzling out the meaning behind art and conversing about it. They reference a report by the Rand Corporation that talks about how the pleasure felt during art-making strengthens peoples’ connection to the world and stimulates new ways of seeing. In addition, the arts can help lessen the gap between rich and poor kids. A $2.6 million NSF grant to weave together arts and STEM-based learning in Sand Diego, Chicago and Worcester. NEA grants supporting art-science projects. A permanent fact of life is that a new economy is emerging and it is huge. It is an economy requiring creativity, imagination and innovation. It is an economy that is global, technology driven and knowledge based. There is a trend here, like a tsunami really, shaping our world and our workforce as never before.